The drawing has been executed on two separate sheets of paper, which meet in its middle. There is a small hole, just to the left of the join, by Juno's head. Several attempts have been made, in drawing the border around the scene, to get it square. The paper has darkened unevenly, giving the drawing a slightly mottled appearance. 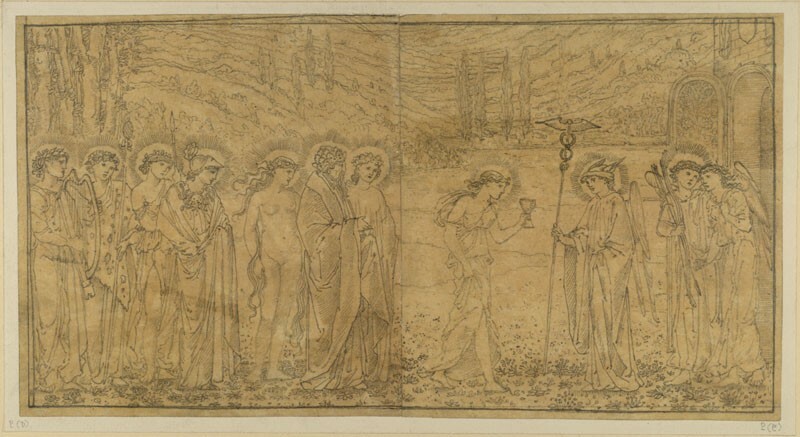 The drawing shows Psyche about to receive the cup containing the liquid that will make her immortal. As a mortal, she is the only figure without a halo, on the right edge, accompanied by her lover Cupid; the couple follow Mercury. The cup-bearer is unidentifiable: she is not named by Morris, whilst in Apuleius, it is Jupiter who hands it to Psyche. She heads a procession comprising, from the right: Juno and Jupiter; Venus, naked; Minerva, wearing a helmet on which her owl perches; Diana, holding a spear; Bacchus, wearing a wreath of vine-leaves and a leopard-skin and holding a thyrsus; and Apollo, wearing a laurel-wreath and holding a harp. The story is drawn from Apuleius's "Metamorphoses" (VI.23 for this incident), although the drawing illustrates William Morris's verse version, "The Story of Cupid and Psyche" (ll. 2457-2469). 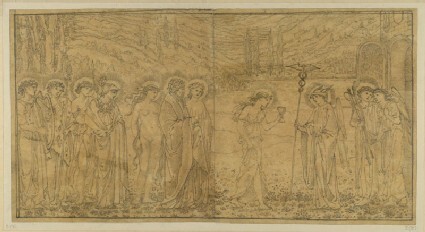 The drawing was made by Burne-Jones c.1864 (or a little later) as a design for a woodcut to illustrate Morris's poem; it was to be one of over 50 such woodcuts intended to illustrate Morris's poem when it was published in "The earthly Paradise", a compendium of 24 poems (two for each month of the year, one classical and one medieval). However, the book was never published, although 46 blocks for "Cupid and Psyche" were cut, 36 or 37 of them by Morris himself. Burne-Jones later reworked several of the compositions for the decoration of the dining-room of 1 Palace Green, Kensington, in 1872. The blocks are now owned by the Society of Antiquaries of London, and were published to accompany a limited edition of "The Legend of Cupid and Psyche" produced by Clover Hill Editions in 1974: the two blocks which make up this scene were printed on pp. 90-91. Several of the original drawings - many of which are part of the Teaching Collection - were used as sources for new blocks, cut to illustrate Robert Bridges' poem "Eros & Psyche", published by the Gregynog Press in 1935: this image appeared as the frontispiece, spread across two (unnumbered) pages. Ruskin included 47 of Burne-Jones's drawings for the woodblocks in the Teaching Collection, listing them for time as nos 64-72 and 223 in the Educational Series in the 1874 catalogue. Only no. 223, depicting Psyche's entry among the gods, is precisely identifiable; the others were lumped together as a single entry, 'Outlines from Apuleius' story of Psyche. (Edward Burne-Jones)'. In the absence of any more specific information as to their arrangement, they have been given specific numbers between 64 and 72 for the present catalogue based upon their sequence in the narrative of Morris's poem. Nos 64-72 were included in Case III, "Illustrations of Northern Gothic, with its Resultant Art", and no. 223 was in Case IX, "Illustrations of the Connection between Decorative and Realistic Design"; it alone had been included in the 1871 Educational Series catalogue, in the same position, but as no. 2 I. None of the drawings features in Ruskin's 1878 reorganisation of the series. In his instructions on using the Educational Series, Ruskin wrote of the latter that it was a perfect example of 'refinement of design obtained by perfectly simple and firm equality of outline; and of the decorative placing and arranging of every accessory' (Educational Series catalogue, 2nd edition, p. 50). He made a similar point in his final lecture on landscape, "Colour", delivered on 23 February 1871, calling the drawing a 'perfect landscape of the living Gothic school', and noting how the outline was intended only to receive colour (Lectures on Landscape, § 92 = XXII.64-65). Speaking of all the "Cupid and Psyche" drawings in the collection in his lecture on Burne-Jones and G.F. Watts on 12 May 1883, he praised Burne-Jones's outline for its purity, calling the drawings 'entirely masterful', and telling his students that 'it is only by trying to copy these or other such outlines, that you will fully feel the grandeur of action in the moving hand, swift as the hawk's flight, and never allowing a vulgar tremor, or a momentary impulse, to impair its precision, or disturb its serenity'. (The Art of England, § 53 = XXXIII.301). By 1878, Ruskin was describing the drawings as 'quite the most precious gift, not excepting even the Loire series of Turners' which he had given the University (Three Colours of Pre-Raphaelitism, § 26 n. = XXXIV.173 n). 223. Psyche received in Heaven. (E. Burne Jones).